The Hyundai i10 is a popular and high selling model from the brand. Now, Hyundai has made a small but smart move to attract more buyers to the i10 by launching a new special edition iTECH i10. It is priced at Rs. 4.25 lakh for the 1.1L iRDE ERA Special Edition (Solid colour) option, Rs. 4.28 for the same variant in metallic colour, Rs. 4.57 lakh for the 1.2 L Kappa Magna Special Edition (Solid) and Rs. 4.60 lakh for the metallic colour options. This limited edition model marks the 12 lakh unit sales mark for the i10 and is a celebration edition. So what exactly is new with this special edition? Let’s find out! 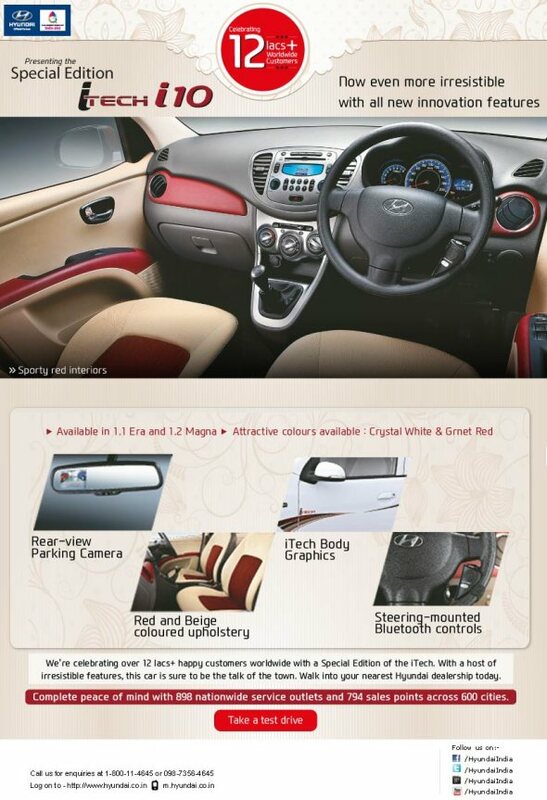 To help differentiate the iTECH i10 further Hyundai has offered it in two new colours: Crystal White and Garnet Red. This i10 is available only in the 1.1 Era and 1.2 Magna variants and Hyundai is charging a premium of Rs.10,000-Rs.20,000 for these special edition models. However if you are looking for some exclusivity then the deal does seem practical. « Force Gurkha vs Mahindra Thar: Which is the better 4×4?